I did it ....I jumped on the quinoa bandwagon!! I was so inspired by a recipe I had seen on Food Blogga and I used this recipe as a way to introduce myself to the quinoa (KEEN-wa). 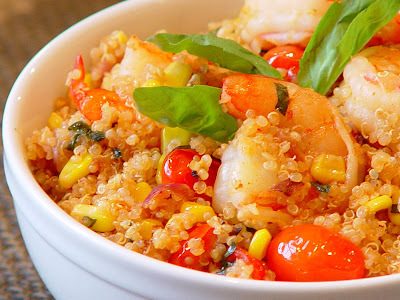 Quinoa has a nutty flavor and is a really nice light and fluffy alternative to long grain rice. It's considered a "superfood", high in protein, gluten free, and it cooks rather quickly. I'm sure it has many other superpowers but what really matters is that this simple recipe is super delicious!!! 1. Cook quinoa according to the package. The quinoa will be done when it turns partially white and the spiral-like germ of the grain is visible. Flake with a fork.